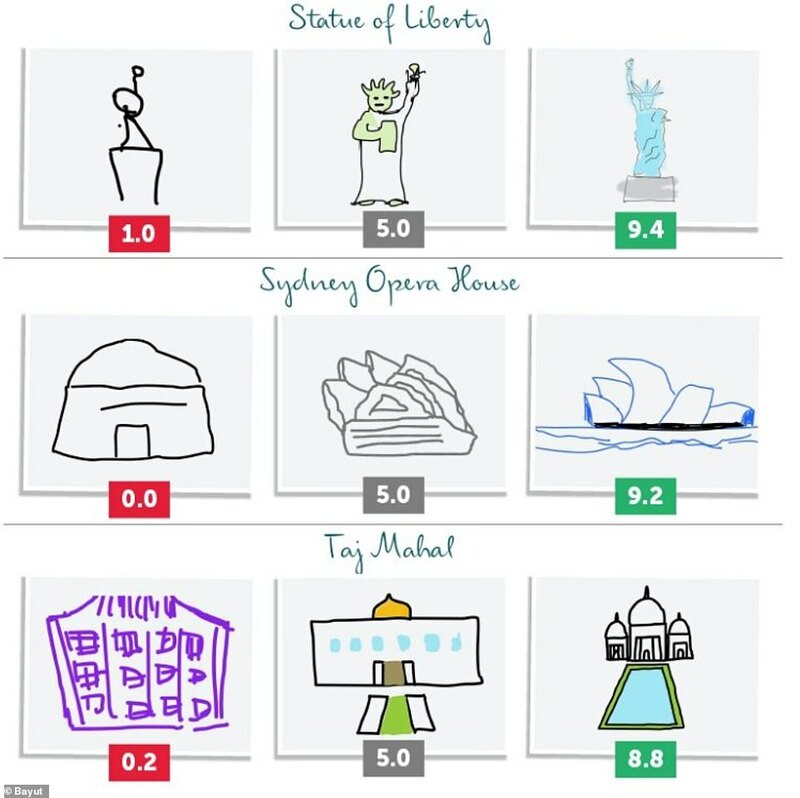 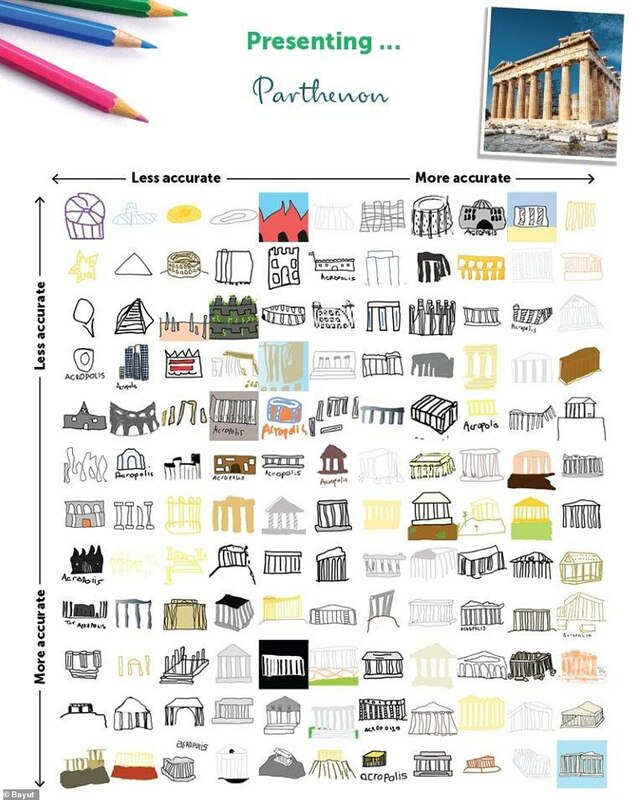 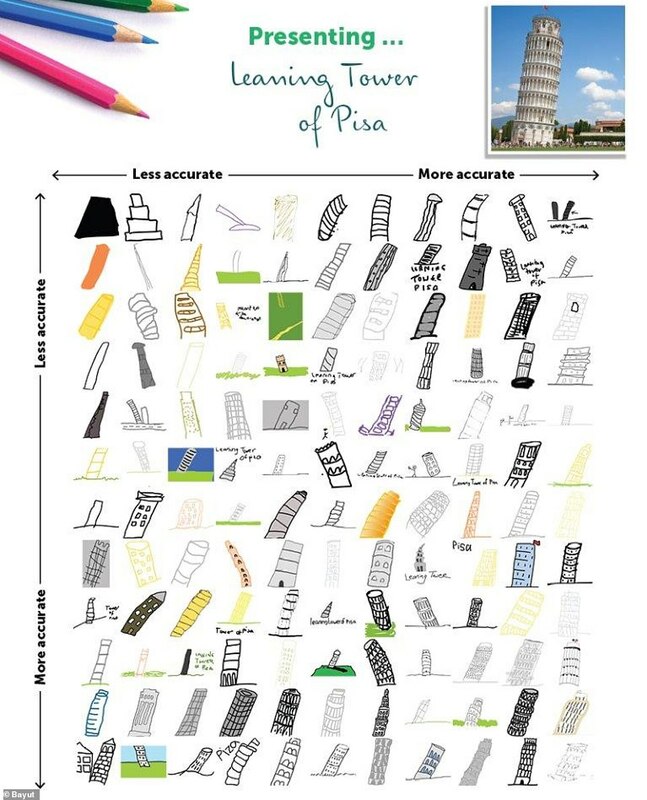 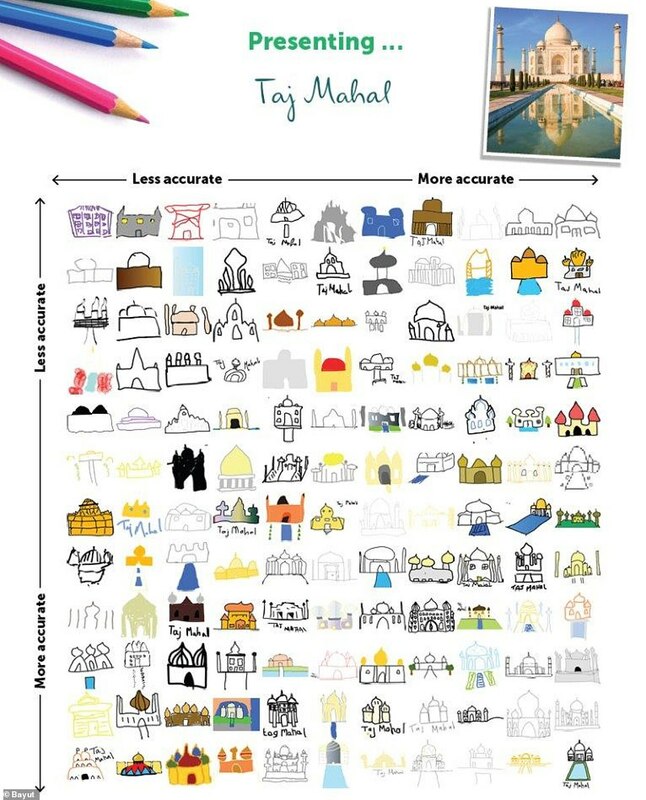 U.S. participants frequently scored higher marks for their drawings than people from the U.K.
UK and U.S tourists were asked to draw some of the world’s most famous landmarks from memory and the results range from the amazingly good to the shockingly bad. 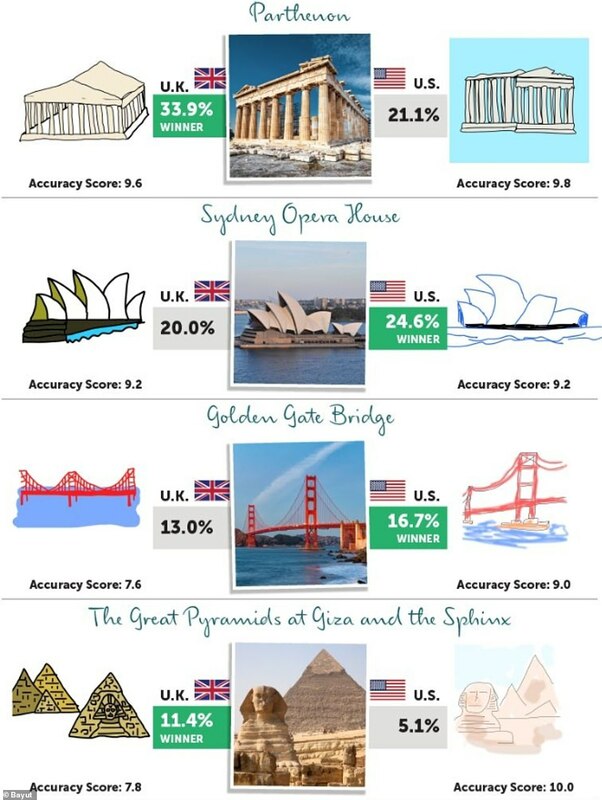 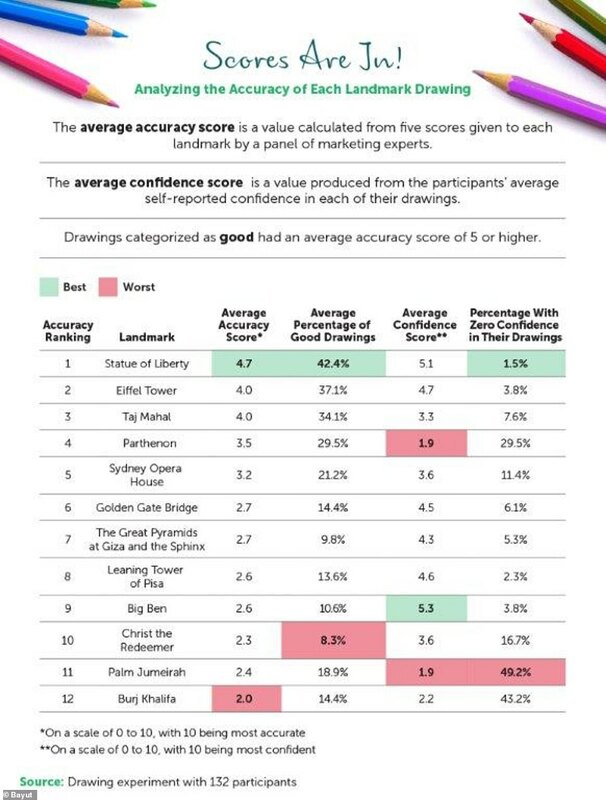 And overall, it seems that it’s Americans who are the better artists with higher accuracy scores than the Brits. 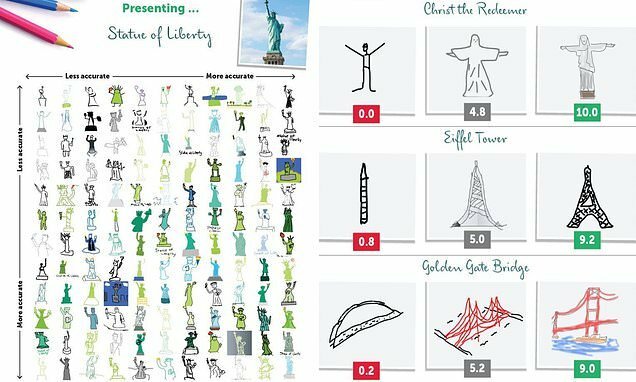 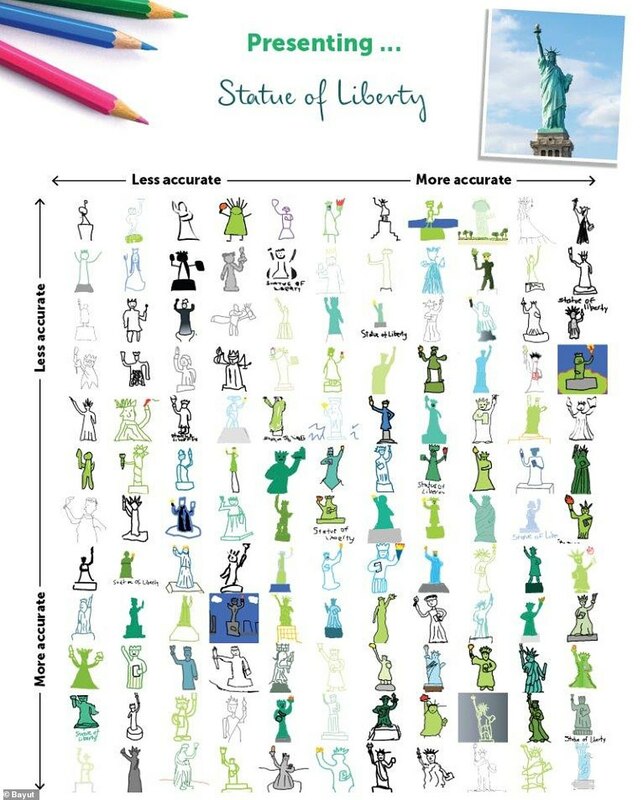 In total, 132 people aged 18 to 64 were asked for their renditions of 12 of the world’s most recognisable tourist attractions, with the Statue of Liberty the best-drawn and Dubai’s Burj Khalifa the least accurately rendered. 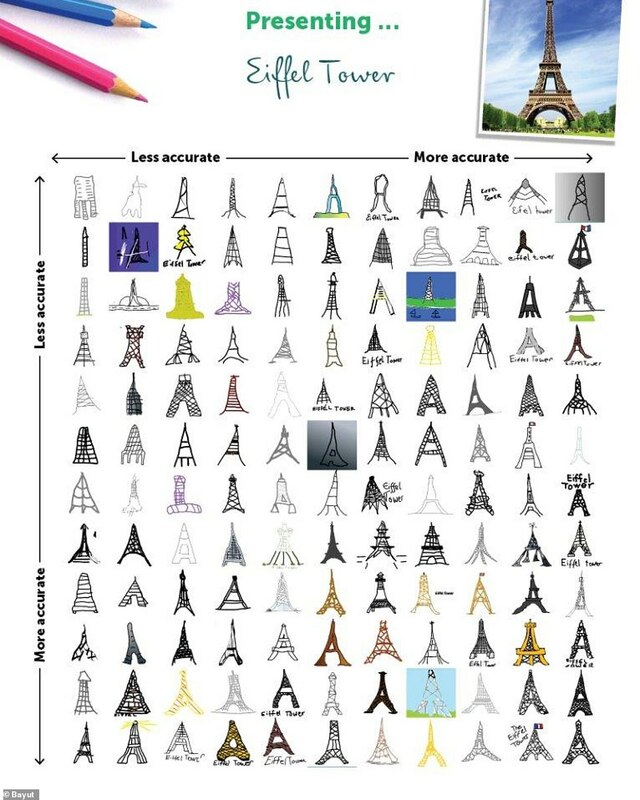 The Eiffel Tower came in at second place in the study by www.bayut.com, with an average accuracy score of four on a 10-point scale, with 10 being the most accurate. 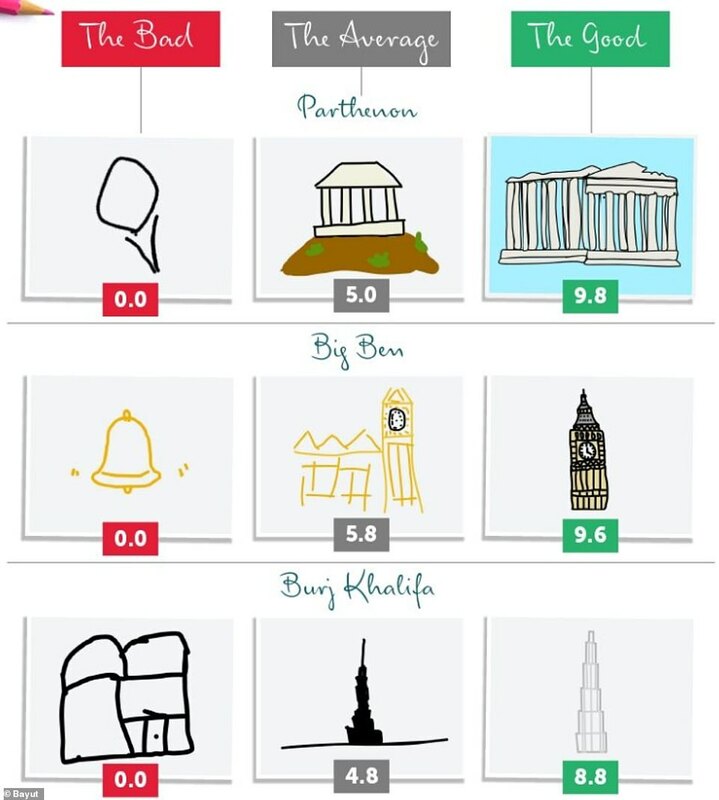 This was followed by the Taj Mahal in India (four), the Parthenon in Athens (3.5), the Sydney Opera House (3.2) and the Golden Gate Bridge in San Francisco (2.7). 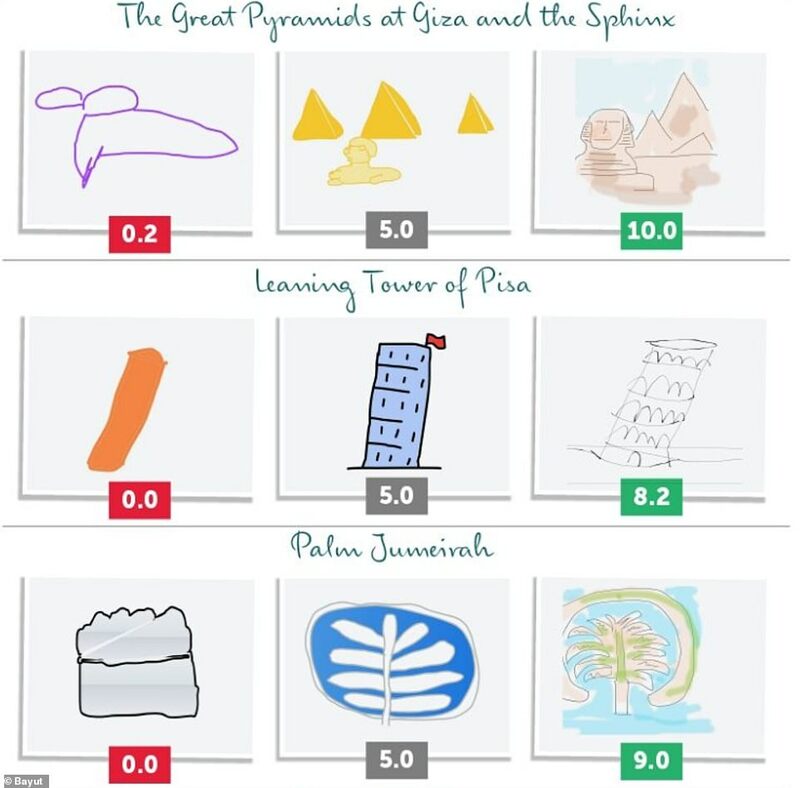 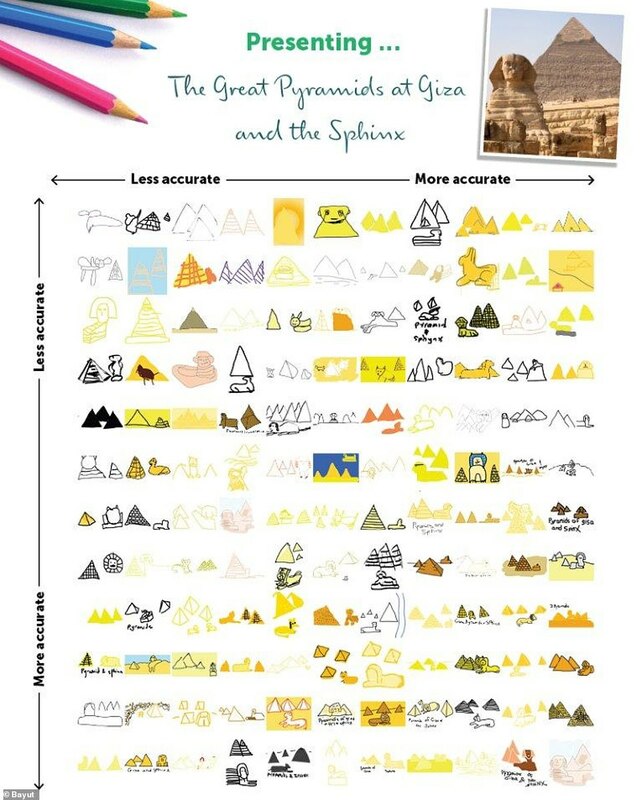 While the Great Pyramids at Giza and the Sphinx in Egypt require little in the way of artistic ability to roughly recreate – a ‘pyramid’ being the giveaway pointer – the site only scored 2.7 on the accuracy scale, with one tourist going off-piste with a few circular shapes. 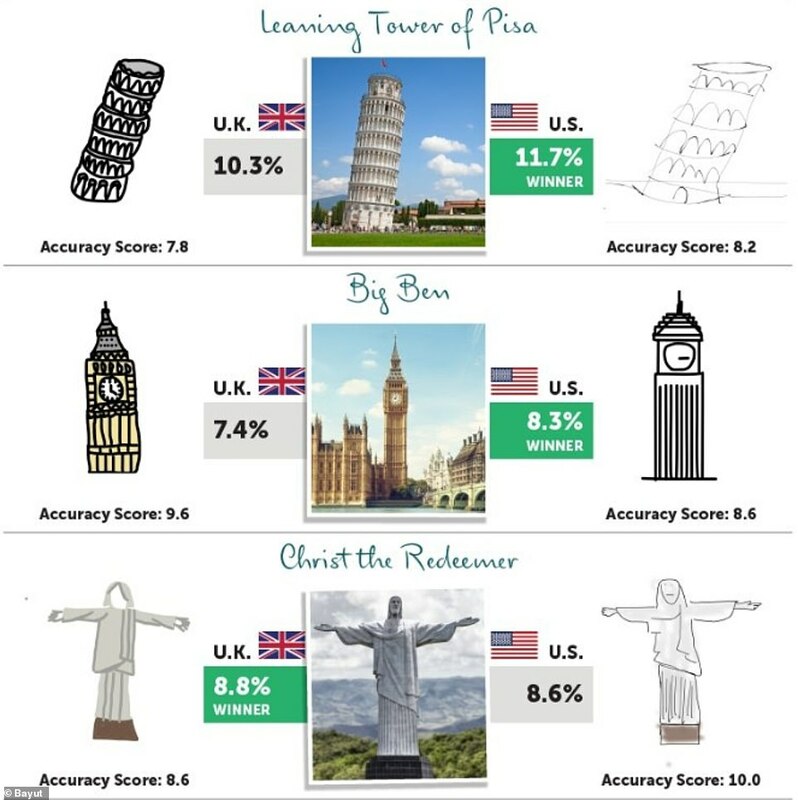 In at eighth place was Italy’s Leaning Tower of Pisa (2.6), followed by Big Ben in London (2.6) and Christ the Redeemer in Brazil (2.3). 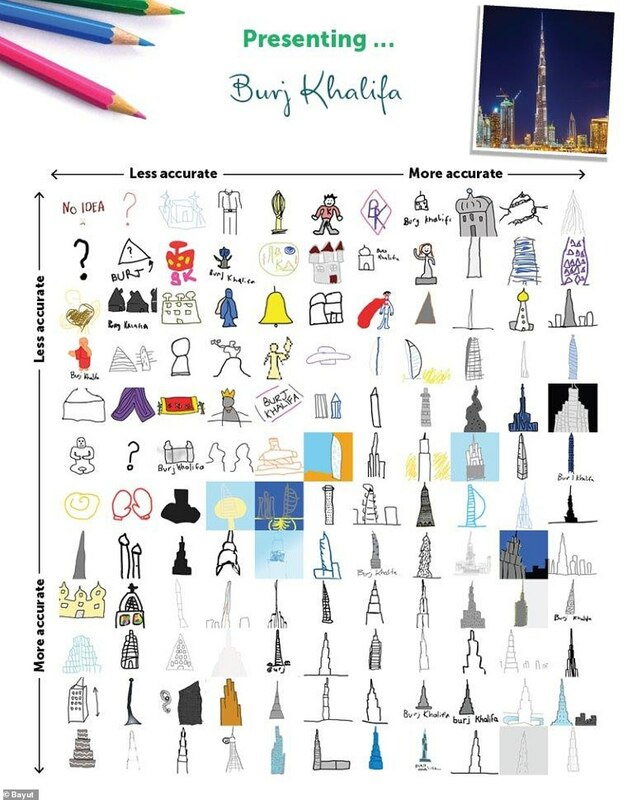 Although Dubai hosted nearly 16 million overnight visitors in 2018 (more than New York City, Singapore and Tokyo) it was landmarks in the Middle East where artists struggled the most. 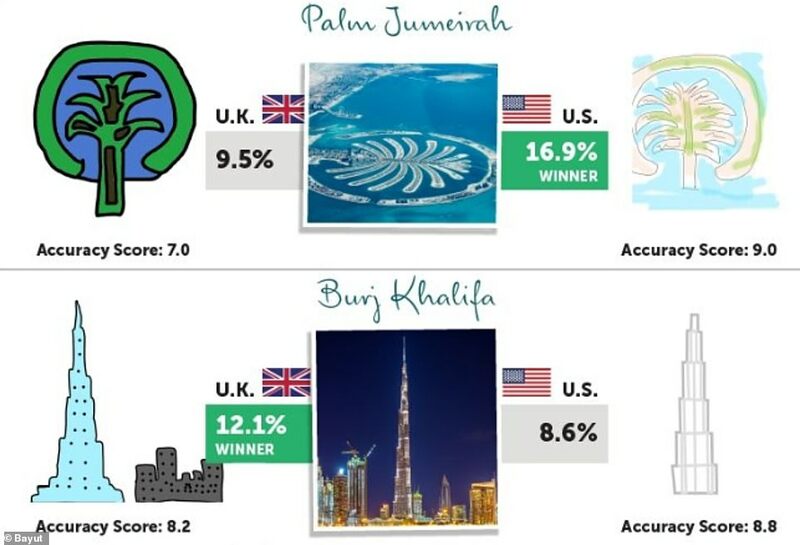 Rounding out the top ten, the Palm Jumeirah in Dubai earned a 2.4 out of 10 for average accuracy, followed by the Burj Khalifa with a score of two. 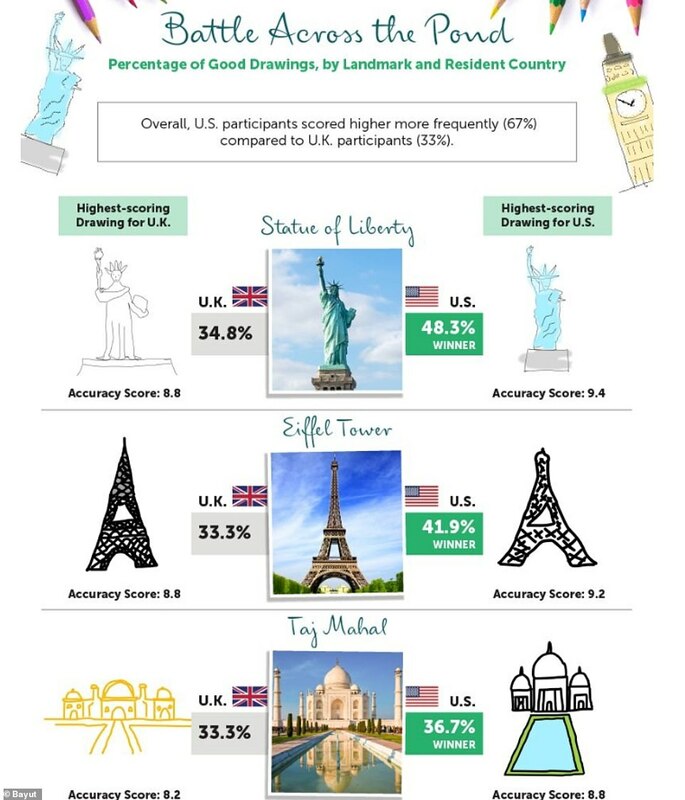 Considering Europeans have more holiday time each year, and a swathe of Americans don’t have passports, you might expect that U.K. residents have a leg-up when recalling landmarks outside the U.S. 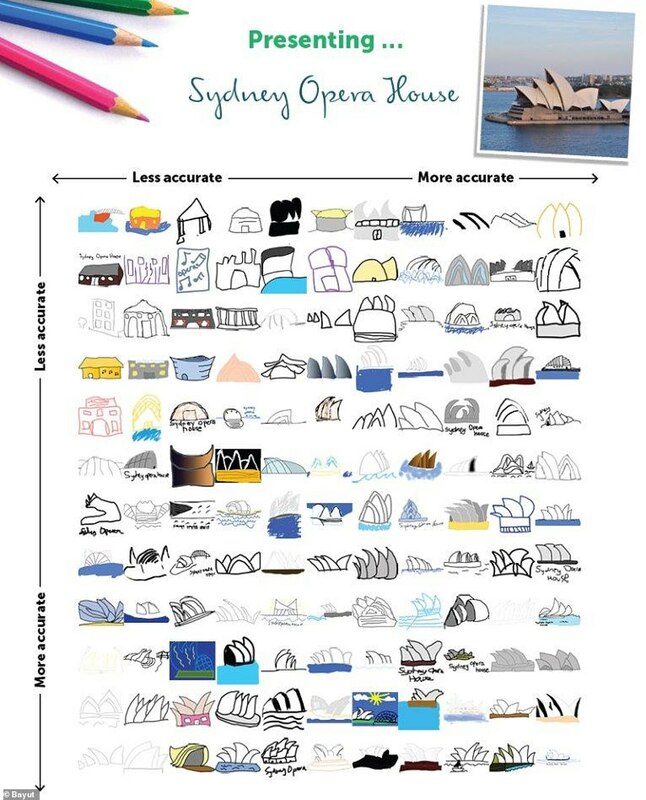 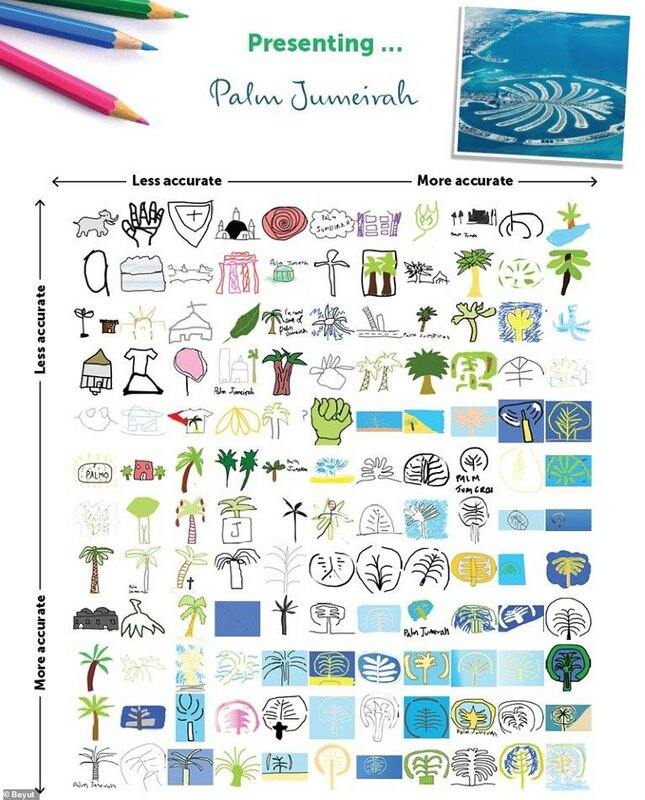 However, U.S. participants frequently scored higher marks for their drawings (67 per cent) than people from the U.K. (33 per cent) – and that doesn’t just include sights within their country. 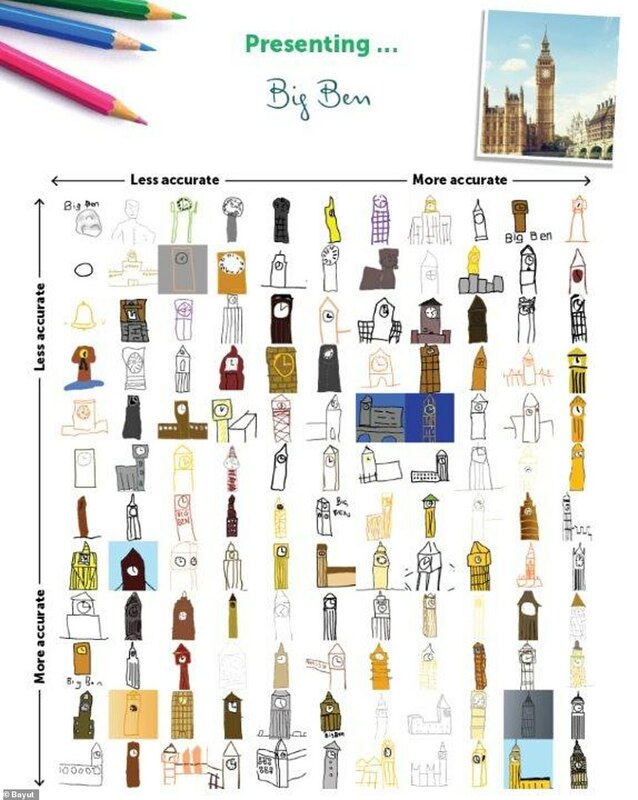 Indeed, Americans managed to draw more faithful pictures of Big Ben in London with U.K. residents scoring below eight per cent for their average accuracy for this building. 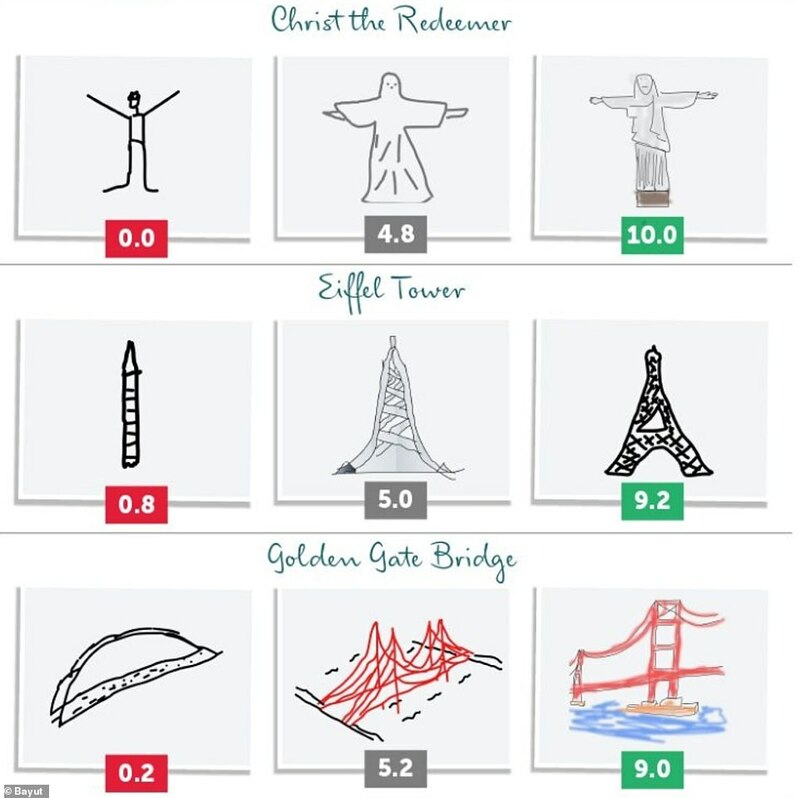 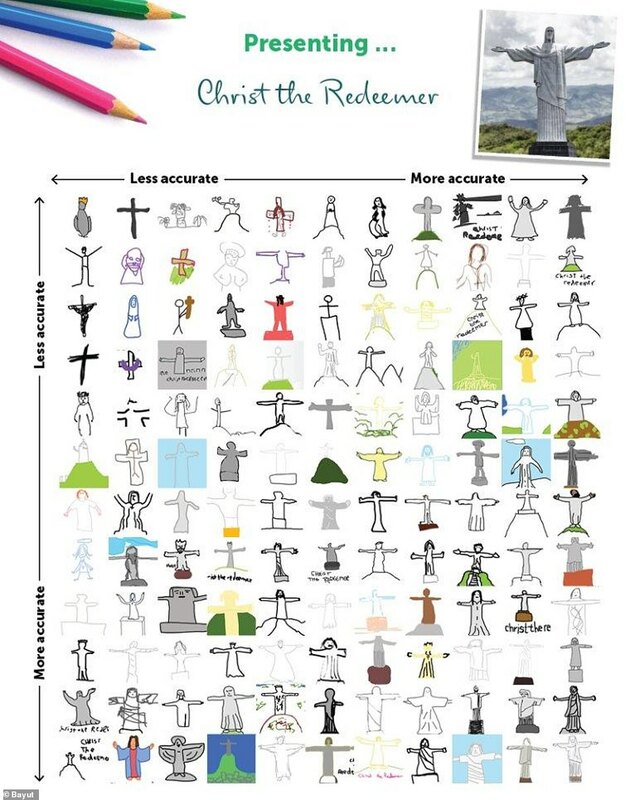 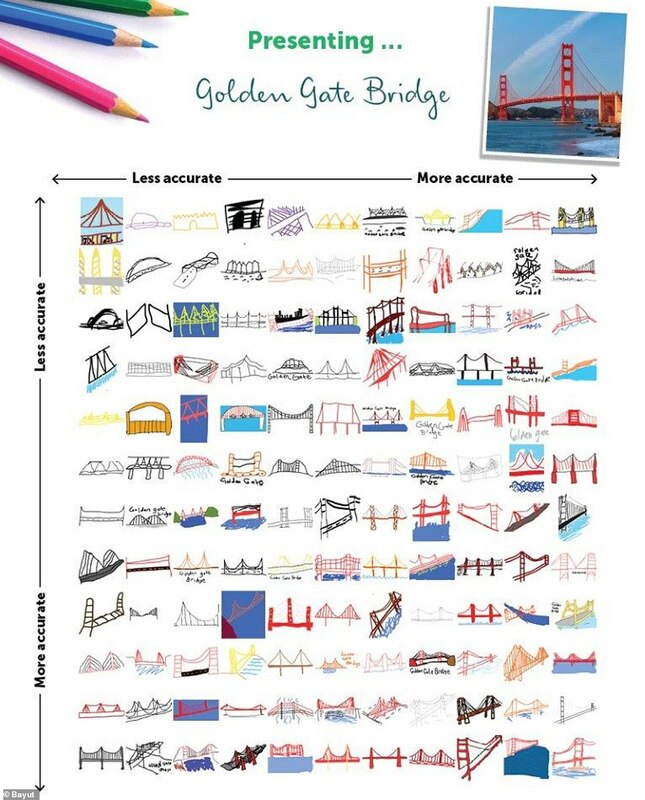 Some of the worse drawings include a rendering of the Golden Gate Bridge that is better compared to a taco shell, and one attempt at Christ the Redeemer that looks more like a stick figure cartoon than one of the New Seven Wonders of The World. 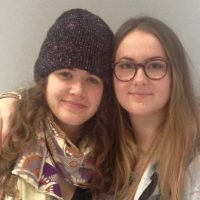 Previous article « I Think Kim Kardashian Could Actually Make a Great Lawyer — May I Present My Evidence? 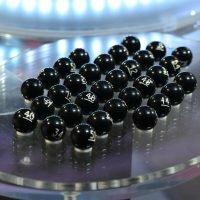 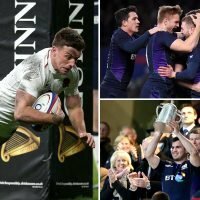 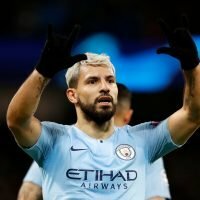 Champions League draw: Can two English sides face each other in the quarter-finals?